To Cite: Noskiewicz J, Sosnowska P, Januszkiewicz-Lewandowska D, Smoczyk W, Surmacz R, et al. Huge Liver Tumor - Therapy Outside the Guidelines, Iran J Pediatr. Online ahead of Print ; 29(3):e74030. doi: 10.5812/ijp.74030. Liver tumors are rare in children. They account for 4% of solid tumors up to 18 years of age (1, 2). We want to present a case of a patient with huge liver tumor who received the therapy outside the guidelines. This is the aim of our article. A four-year-old boy was admitted to the hospital due to abdominal pain, vomiting, discoloration of stool, and a noticeable lack of appetite for a month. He had not been ill before or received chronic medications. The perinatal interview was also correct. Physical examination on admission showed a significantly enlarged liver and an immovable mass of 13 cm in diameter and hard consistency located below the lower border of the liver. The patient also had pale skin and yellowish sclera. No other significant abnormalities were found on physical examination. 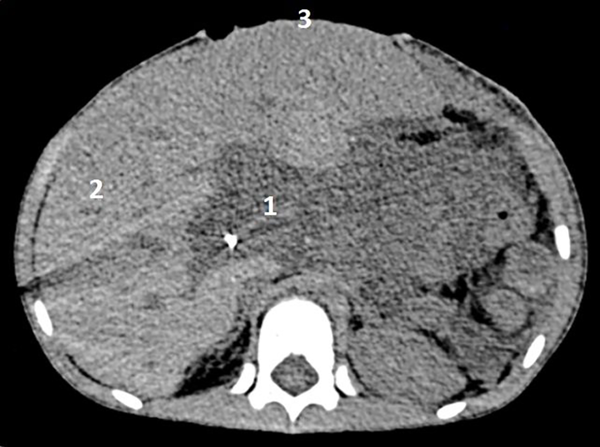 Ultrasonography and computed tomography of the abdomen revealed a tumor surrounding the left liver lobe (Figure 1). The tumor modeled and infiltrated the hepatic hilum and such important blood vessels as the portal vein and the hepatic artery. It also displaced the inferior vena cava to the right and the aorta to the left (PRETEXT: 1 VPE). Additional imaging studies and bone marrow biopsies did not reveal any metastases. The level of alpha-fetoprotein (AFP) was normal (1.82 µg/L). A biopsy and subsequent histopathological examination led to the diagnosis of embryonal rhabdomyosarcoma (RMS) of the liver. Induction chemotherapy was applied (consisting of one cycle of ifosfamide, vincristine, and D-actinomycin; one cycle of carboplatin, epirubicin, and vincristine; and one additional dose of vincristine). An angiography of the hepatic artery was performed through the right femoral artery, combined with coil embolization of arterial branches of the right hepatic artery, which were a major vasculature of the neoplasm. Despite the implemented treatment, the tumor mass and size increased. Furthermore, since the patient was hemodynamically unstable, the surgery following the endovascular embolization was delayed. Considering the growing signs of multiple organ failure resulting from the increased abdominal pressure, a decision was made to create a temporary ventral hernia using a surgical mesh covered on both sides with antimicrobial drapes, in order to allow chemotherapy to continue. After a month, due to the symptoms of intolerance to systemic chemotherapy and critical conditions of the patient, it was decided to perform life-saving cytoreductive surgery. A resection of the left lateral liver segments 2 and 3 where the tumor was located was performed using an ultrasonic knife, leaving a surgical margin of 0.5 cm. Intersected liver tissues were treated with argon coagulation and covered with tissue glue. The infiltration of the portal vein and the hepatic artery, previously observed on CT, was excluded intraoperatively. The abdominal wall was reconstructed, as well. Effectively, a radical resection of the tumor was achieved. After surgery, the patient's condition improved significantly. The final histopathological examination confirmed the initial diagnosis of embryonal RMS of the liver made after the biopsy. The margins of the resection were normal, and no metastases to lymph nodes were found. Postoperative chemotherapy continued and radiotherapy was introduced. Currently, the boy is remaining in a state of complete remission, with the observation period of three years. Liver tumors account for 4% of solid tumors in children; yet, they mostly consist of neuroblastoma or nephroblastoma metastases. Primary tumors make up less than a quarter of all solid changes in the liver, with hepatoblastoma and hepatocellular carcinoma being the most common diagnoses. Primary sarcomas in the liver, such as rhabdomyosarcomas, are usually diagnosed in young children (1, 2). The presented patient had symptoms that, apart from jaundice and fever, are most frequently described in rhabdomyosarcoma in children. Radiological examination revealed a tumor mass. CT is necessary to determine the anatomical relationships between the liver tumor and surrounding vital structures, especially when the neoplasm is located in the hepatic hilum. The relationship between the tumor and the main vessels (inferior vena cava, portal vein, and hepatic artery) should be evaluated with particular care. 3D computer reconstructions should also be considered as a basic and mandatory tool to assess the anatomical relations and the possibility of tumor resection. This method also provides an alternative to invasive angiography. PET/CT is also a valuable tool for initial staging in children (3-5). Any hemodynamically stable patient with a large hepatic tumor, with signs of malignancy observed in CT examination, should first undergo a biopsy. Obtaining a histopathologic diagnosis enables the implementation of neoadjuvant chemotherapy, which is intended to reduce the size of the tumor and increase the possibility of a radical resection. Children with rhabdomyosarcoma of the liver respond well to chemotherapy in most cases. However, there have been frequent complications after the implementation of chemotherapy, in particular, an increased risk of sepsis leading to death (2, 6). Abdominal tumors with high growth rates can cause many systemic symptoms in children. These symptoms stem from the increased intra-abdominal pressure due to the rapid expansion of the tumor mass. The growing signs of multiple organ failure resulting from the increased abdominal pressure necessitated the creation of a temporary ventral hernia. According to the authors, this procedure can be used repeatedly, but the mesh and drapes should be replaced at 14-day intervals. The enlargement of the abdominal wall produces a drop in intra-abdominal pressure and consequently, an improvement in the hemodynamics and general condition of the patient. The possibility of radical surgery should be determined using radiological examination before the qualification for surgical treatment. However, tumors located within the liver hilum and infiltrating the surrounding vascular structures are considered inoperable. Radiological diagnostic performed in the presented patient, including 3D computed tomography reconstructions, showed the presence of main vessels, especially the portal vein, inside the tumor sphere (3). The decision of live-saving cytoreductive surgery was made due to the increasing intra-abdominal pressure and the critical condition of the patient. Intraoperatively, the infiltration of the portal vein and other major hepatic vessels was not confirmed; so, the subsequent radical resection of a liver tumor could be achieved. It indicates that radiological examination may be misleading. It is most probably due to a similarity in the density of the non-encapsulated tumor and the surrounding inflamed tissues containing distended and anatomically changed vascular structures. In the cases where liver tumor resection is impossible, liver transplantation seems to be an alternative form of therapy (7, 8). The presented case study proves that the creation of a ventral hernia effectively reduces the symptoms caused by increasing intra-abdominal pressure and allows the oncological treatment to continue. Furthermore, in the case of multiple organ failure arising because of the rapid expansion of tumor mass, a cytoreductive surgery can be a life-saving treatment. Imaging cannot be also the only factor in deciding whether to undertake a surgical treatment in the case of a child with neoplasm. Authors' Contribution: Study concept and design: Jakub Noskiewicz, Przemyslaw Mankowski, Patrycja Sosnowska, Danuta Januszkiewicz-Lewandowska, and Olgierd Pietkiewicz; acquisition of data: Jakub Noskiewicz, Przemyslaw Mankowski, Patrycja Sosnowska, Olgierd Pietkiewicz, Wieslaw Smoczyk, and Rafal Surmacz; analysis and interpretation of data: Jakub Noskiewicz, Przemyslaw Mankowski, Patrycja Sosnowska, Danuta Januszkiewicz-Lewandowska, Rafal Surmacz, and Wieslaw Smoczyk; drafting of the manuscript: Jakub Noskiewicz, Patrycja Sosnowska, Przemyslaw Mankowski, Wieslaw Smoczyk, and Rafal Surmacz; critical revision of the manuscript for important intellectual content: Jakub Noskiewicz, Olgierd Pietkiewicz, Patrycja Sosnowska, Danuta Januszkiewicz-Lewandowska, Przemyslaw Mankowski, and Rafal Surmacz; administrative, technical, and material support: Jakub Noskiewicz, Przemyslaw Mankowski, Patrycja Sosnowska, and Wieslaw Smoczyk; study supervision: Przemyslaw Mankowski and Danuta Januszkiewicz-Lewandowska. Conflict of Interests: The authors declare that they have no conflict of interest and they have no financial interests related to the material in the manuscript. Funding/Support: It is none declared by the authors. 1. Tannuri AC, Tannuri U, Gibelli NE, Romao RL. Surgical treatment of hepatic tumors in children: Lessons learned from liver transplantation. J Pediatr Surg. 2009;44(11):2083-7. doi: 10.1016/j.jpedsurg.2009.06.003. [PubMed: 19944212]. 2. Brugieres L, Branchereau S, Laithier V. [Paediatric malignant liver tumours]. Bull Cancer. 2012;99(2):219-28. French. doi: 10.1684/bdc.2011.1539. [PubMed: 22266074]. 3. Dong Q, Jiang B, Lu Y, Zhang H, Jiang Z, Lu H, et al. Surgical management of giant liver tumor involving the hepatic hilum of children. World J Surg. 2009;33(7):1520-5. doi: 10.1007/s00268-009-0060-0. [PubMed: 19424748]. 4. Sorge I, Bierbach U, Finke R, Hirsch W. Multiple malignant and benign lesions in the liver in a child with adrenocortical carcinoma. Pediatr Radiol. 2008;38(5):588-91. doi: 10.1007/s00247-008-0755-7. [PubMed: 18256815]. 5. Baum SH, Fruhwald M, Rahbar K, Wessling J, Schober O, Weckesser M. Contribution of PET/CT to prediction of outcome in children and young adults with rhabdomyosarcoma. J Nucl Med. 2011;52(10):1535-40. doi: 10.2967/jnumed.110.082511. [PubMed: 21903740]. 6. Czauderna P, Mackinlay G, Perilongo G, Brown J, Shafford E, Aronson D, et al. Hepatocellular carcinoma in children: Results of the first prospective study of the International Society of Pediatric Oncology Group. J Clin Oncol. 2002;20(12):2798-804. doi: 10.1200/JCO.2002.06.102. [PubMed: 12065556]. 7. Shen CH, Dong KR, Tao YF, Chen G, Li RD, Zhang QB, et al. Liver transplantation for biliary rhabdomyosarcoma with liver metastasis: Report of one case. Transplant Proc. 2017;49(1):185-7. doi: 10.1016/j.transproceed.2016.11.028. [PubMed: 28104133]. 8. Stringer MD. The role of liver transplantation in the management of paediatric liver tumours. Ann R Coll Surg Engl. 2007;89(1):12-21. doi: 10.1308/003588407X155527. [PubMed: 17316514]. [PubMed Central: PMC1963524].